Ready to have your meat-loving world rocked? With just $500 you can score a grill that is finally going to cook a perfectly seared, mouth-watering steak evenly and with a perfect sear. Frankly, your barbecue will smell so good your neighbors are going to be beating down your door wanting to know what is cooking and if they can come join you. This could be good or bad, depending on how much you like your neighbors. But definitely a good thing if you are serious about enjoying your barbecuing experience as much as the meat coming off your grill at meal time. The Final Sear: The Weber Spirit II E-310 is the top performer in this category. The original Spirit is the first grill I ever purchased and I was blown away by the hallmark Weber cooking experience delivered. You can’t beat the quality of a Weber. Mine is 5+ years old and looks as good as new. The power and heat distribution is amazing. If you are looking for quality get a Spirit. For one, you should expect more grilling surface area. You can cook for the whole family with room to spare. A whole rack of ribs is going to be a breeze. And I am HUGE rib freak, so if you’re like me, you know that extra space is essential. You should also expect to see quick and even heating. With a bigger budget, all of the essential functions should perform perfectly. I’ve put together a list of my top picks, researched extensively for this price range, any of which will seriously transform your outdoor cooking experience from a necessity to a recreational activity. I’ll break down the top features AND nitpick any cons that you should know about before buying. The E310 doesn’t come equipped with a side burner. You’ll have to upgrade to the Genesis for that. While I occasionally like to use one, it’s not a deal breaker and is a pretty minor. If your main concerns are quality and budget, then this shouldn’t be a major deterrent for you and for the under $500 gas grill field, this is the very best on the market. The Spirit II has a solid 4.3 out of 5 star rating on Amazon with over 225 reviews. 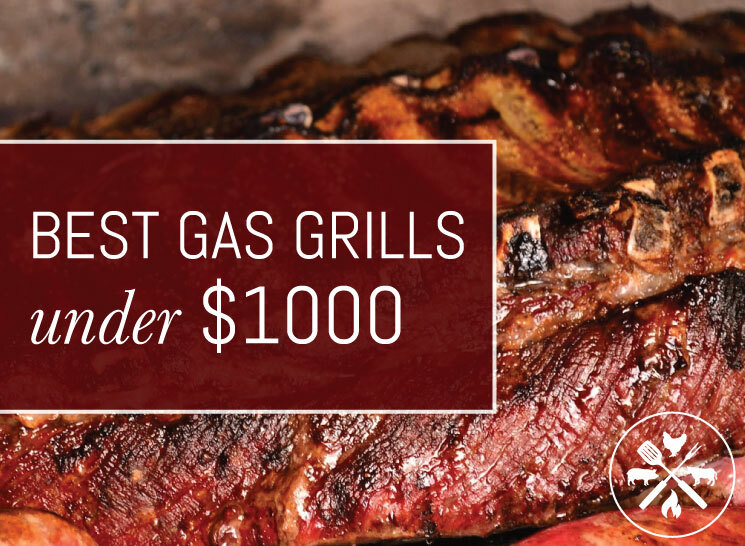 Monument earned a spot in the top 3 for offering a reasonably priced grill with a full feature list and an impressive amount of power. This 4 burner packs a serious punch. It is the most powerful grill in our top line up, with 72,000 BTUs for 4 burners and an additional side burner. The total cook space is 723 square inches, with 513 primary and 210 square inches of glorious warming rack. It comes in higher than both the Weber and Camp Chef on size. The 17842 is well made, with all stainless steel housing and blue LED knob lighting for cooking in the dark. It also offers pilotless one button ignition for easy start-ups, porcelain-coated cast iron cooking grates and a built-in thermometer for easy temperature monitoring. Stainless steel flame tamers maintain even heat delivery for consistent cooking across the entire cook surface. Reviewers rave about this grill, and give it a solid 4.5 out of 5 stars on Amazon. This is a serious 3 burner grill, coming in at the top of our price range and as a Weber, I would expect nothing less. This grill also receives excellent reviews on Amazon, with a top-level 4.5 star overall rating. I know what you’re thinking, why am I showing you a griddle that looks like it belongs in a restaurant kitchen when you’re looking for grills? This huge 600 square inch beast represents the future of grill style and practicality. It is versatile. You can choose to use the griddle plates to cook up a tower of pancakes or switch over to grill grates if you’re hungry for some burgers. You can even enjoy a half and half situation and make burgers AND pancakes. This is a professional restaurant grade grill that you can bring home and enjoy in your backyard. It offers 604 square inches of griddle space, and 501 square inches of grilling area to churn out enough food for 50-100 hungry guests PER HOUR. It boasts four 12,000 BTU stainless steel burners for 48,000 total BTUs and electronic ignition. Heat distributes evenly so there are no hot spots and you get a consistent grill on everything you’re cooking. The Camp Chef also features two roomy folding side shelves for easy prep. The grease management system is also intelligently design for easy clean up and no flare ups. The grill grates are stationery and the griddle grates are placed over them when you’re ready to switch over. Users are obsessed with this grill and give it 4.5 out of 5 stars with 133 reviews on Amazon. This big bad beast from Char-Broil is a top pick for sheer size on this list and is a great value for the money if you regularly grill for a big crew. The Performance 550 offers a mega-sized primary cooking are at 550 square inches and an additional 205 square inches of secondary warming rack for buns and veggies. It comes with 5 burners, including a 10,000 BTU lidded side burner. Main burner power comes in at 45,000 BTUs. It also comes with electronic ignition for quick and easy start-ups and a built-in lid-mounted thermometer. Overall construction and fascia is stainless steel, with a large lower storage cabinet for tools and to hide the propane tank. Stationary steel side shelves provide for extra prep space. This is a great offering from Char-Broil and one of the bigger units in their Professional line up. The first time I saw the Fuego F24C, I wasn’t sure if I should cook on it or send it up into space. It’s the brainchild of a former designer from Apple and it’s a definite stand out on this list for it’s circular design and innovative tech approach to grilling. In terms of heat, like its name suggests, this grill really brings it. The main selling point for the Fuego is that it heats up to 500 degrees in just 5 minutes. Thanks to its dual zone heating system, the Fuego gives you the option of cooking just on the outer burner for lower temp, slower cooking, or to turn on the second burner to make full use of the 700 degrees of heat it can produce. The design makes very good use of space, and there are no hotspots at all, so you can cook perfectly on every inch of the space it provides. The round grill is deceptively large, and you can fit 10-15 burgers on without issue. This is a great grill for the more tech-minded griller who doesn’t have or need much space. With the E210, Weber took the very best, core features of their larger grills and engineered them to fit in a neat, compact version that still packs a power punch. The Spirit delivers 26,500 BTUs with 450 sq inches of cooking space and 90 inches of warming rack. This grill provides solid, even heat to every inch. Weber added in their new Gs4 grilling system, with two burners, each supported by stainless steel, top quality tubes. These tubes aren’t your typical burner tubes. They won’t rust quickly, or damage easy and leak gas. They are in fact, specifically designed to be durable and they actively limit the effects of rust agents. Even with just two burners, the Weber really feels like a portable outdoor kitchen. It comes with reasonably sized drop down tables on both sides (more room to layout food) that fold down for easy storage. Both tables are equipped with 3 sturdy hooks to hang your tools (pans, spatulas, knives, etc.). You can also expect to enjoy Weber’s signature Flavorizer bar system, porcelain coated cooking grates (designed for quick cleaning), and the new infinity electronic ignition system. We raved about the 5-burner version of this grill and the 475 4-burner is another great choice if you’re looking to spend a little less and don’t need as much cooking space. The 4-burner 475 offers 36,000 BTUs of total cooking power, with a nice 10,000 BTU lidded side burner for sauce or side prep, 475 square inches of primary cooking space and 175 square inches of warming rack, both with porcelain-coated cast iron cooking grates. The lid, handle and control panel are well made and constructed of stainless steel. You’ll find a lid-mounted thermometer and a removable grease pan for easy clean-up. The metal side shelves are roomy and there’s a lower cart area for basic storage. Like the 5 burner, it also includes electronic ignition. Napoleon is known for making exceptional built-in gas grills for luxury backyard kitchen experiences. I was so pumped to see a smaller standalone grill from them that is complete with a great list of features. The TravelQ portable comes equipped with heavy-duty “Wave” porcelain cooking grids over 285 square inches of total cooking space. It offers two stainless steel burners and 12,000 total BTUs of power (just a little disappointing, I was hoping for more like 10,000 each). The Napoleon includes folding side shelves and a lower rack for basic storage. It also sits on a folding scissor cart for easy storage and portability. It can also be customized with insertable griddle plates if you want to purchase them separately. This grill is not as easily portable as the Coleman RoadTrip, but it is a solid option for a smaller backyard space. I love this big stationary grill from Napoleon. It screams quality in every square inch and is a great option if you have a little more to spend. The Triumph comes equipped with 4 primary burners and 1 lidded side burner, 57,200 BTUs of overall power, 665 square inches of overall cooking area, stainless steel burners and sear plates, their signature, cast iron wave cooking grids enameled in porcelain for consistent heat and cooking and a quick start electronic ignition system. It also comes mounted on a well-designed, modern cabinet for extra storage, along with two roomy, foldable side shelves for meal prep with built-in utensil holders. I’m also a big fan of the integrated bottle opener on the side – for critical beer consumption while cooking. The ZH3003 offers both gas and charcoal sides for a versatile cook experience, 810 square inches of total cooking area, 27,000 BTUs of power for 3 burners, porcelain-coated cast iron cooking grates, a removable grease drip tray on the gas grill side, and a removable ashtray design for the charcoal half. The charcoal grill also comes equipped with front and upper air dampers to maximize the flow of air. This is a HUGE grill. The Royal Gourmet Classic 6 is the largest grilling machine on this list and is a shiny steel backyard beast. Here’s what you can expect from the RG: 5 stainless steel burners plus an extra powerful sear burner AND a lidded side burner for sauce prep. Total cooking power comes in at a serious 71,000 BTUs for even heat distribution. The total cooking space on this guy is 802 square inches which includes a 199 square inch warming rack. The cook grates are porcelain-coated cast iron. You’ll also find a built-in hood mounted thermometer, an easily removable grease tray, lower cabinet and roomy side shelves and a quick, electronic ignition system. This grill doesn’t have back closure so it will vent out the backside. This is the main reason it falls so far down on our list. It gets high marks for offering so much space for a relatively low price tag. This monument grill snagged our #3 spot, but that was the version offered in stainless steel with the rotisserie kit. Monument also offers this grill in black, without the rotisserie for a lower price point. This grill has all the same features of our top pick with the two exceptions noted above. You’ll find, 4 burners, 60,000 BTUs of cooking power, 513 square inches of cooking area, a 210 square inch warming rack, a lidded side burner and porcelain-coasted cooking grates. It also has the standard center-mounted temperature gauge and electronic ignition for an easy start-up. If you’re not picky about color and don’t think a rotisserie kit is something you’ll use, this is a great alternative to consider. This is a commercial-grade grill from Dyna-Glo that is designed to feed an extra large crew. This is a great pick for event spaces or if you regularly host extra-large parties, this is one to consider. This dual-fuel option from Dyna-Glo includes commercial grade stainless burners, porcelain-enameled cast iron cooking grates, 952 square inches of total cooking area (this can accommodate almost 40 burners at once), 24,000 total BTUS of cooking power and a removable grease management system. The Dual-Fuel feature means you can use this grill both with propane and charcoal for a versatile half-and half cooking experience. It also offers a large lower storage cabinet with doors to hide anything you want to tuck away while managing this grill beast. This 8-burner behemoth from Royal Gourmet isn’t really designed for the casual backyard grillman. This grill is more suited for large event spaces, like church bbqs, picnic spaces or event halls. The Royal Gourmet Event Grill features 8 stainless tube burners, 104,000 BTUs of total cooking power, 2 regulators for the propane system, 950 square inches of total cooking space and porcelain-coated cooking grates. It also includes a stainless steel control panel for extra durability, an electronic ignition system, and large capacity grease management system. Since this grill is designed to feed a small army, it also has roomy side shelved for prep and two lower shelves for serious storage.